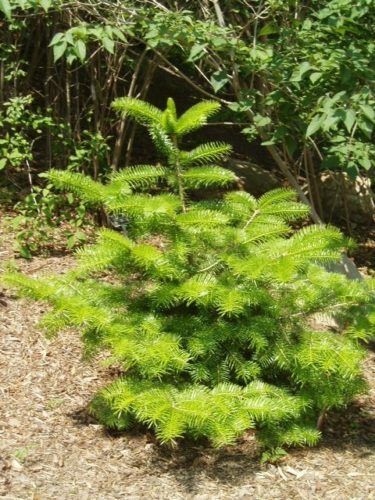 Abies nephrolepis, first described by Ernst Rudolf von Trautvetter (1809–1889), work completed in 1866 by Carl Maximowicz (1827–1891), is commonly known as Manchurian fir, Hinggan fir, eastern Siberian fir in the English language; as Пихта белокорая (pikhta amurskaya) in Russia; as 臭冷杉 (chou leng shan) in China; and as 분비나무 in Korea. A tree on the Shkotovo Plateau, Ussuriland, Russia; said to be the world's tallest. Understory shrub is Microbiota decussata. photo by Vladimir Dinets. Description. 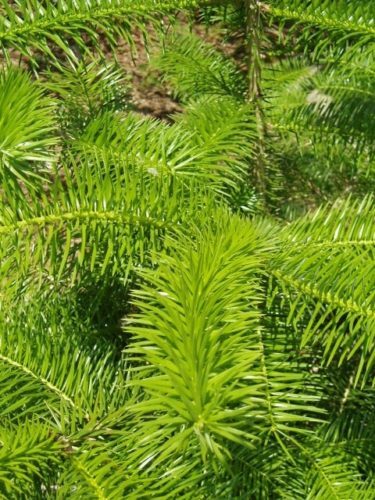 Manchurian fir is an evergreen coniferous species of tree that will grow to heights of 100 feet (30 m) tall with a trunk up to 4 feet (1.2 m) diameter and a narrow conic to columnar crown. The bark is grey-brown, smooth on young trees, becoming fissured on old trees. The leaves are flat needle-like, 0.4 to 1.2 inches (10 – 30 mm) long and 0.06 to 0.08 inch (1.5 – 2 mm) broad, green above, and with two dull greenish-white stomatal bands below They are spirally arranged, but twisted at the base to lie flattened either side of and forwards across the top of the shoots. 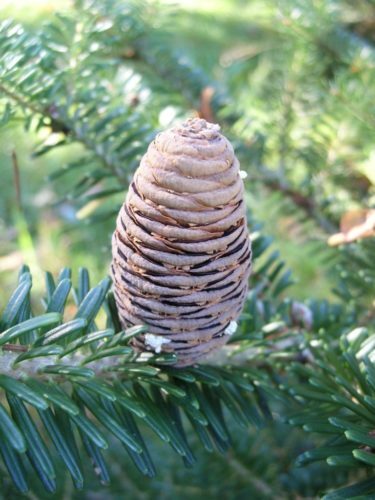 The seed cones are 1.8 to 2.8 inches (4.5 – 7 cm) (rarely to 3.8 in/9.5 cm) long and 0.8 to 1.2 inches (2 – 3 cm) broad, green or purplish when young, ripening to gray-brown, and often very resinous. The tips of the bract scales are slightly exserted between the seed scales. Each seed scale bears two winged seeds, released when the cones disintegrate at maturity in the autumn. Distribution. This species is native to northeastern China — Hebei, Heilongjiang, Jilin, Liaoning, and Shaanxi provinces; North Korea, South Korea, and southeastern Russia — Amur Oblast, Jewish Autonomous Oblast, Primorsky Krai, and southern Khabarovsk Krai, where it grows at at elevations varying from 1,600 to 2,200 feet (500 - 700 m) above sea level near its northern range limits, and to 2,400 to 6,500 feet (750 - 2000 m) near the southern ranges. It grows in cold climates where most precipitation falls as snow. Abies nephrolepsis Photo taken in the Asian Collection of the US National Arboretum in Washington, D.C. during May of 2006. 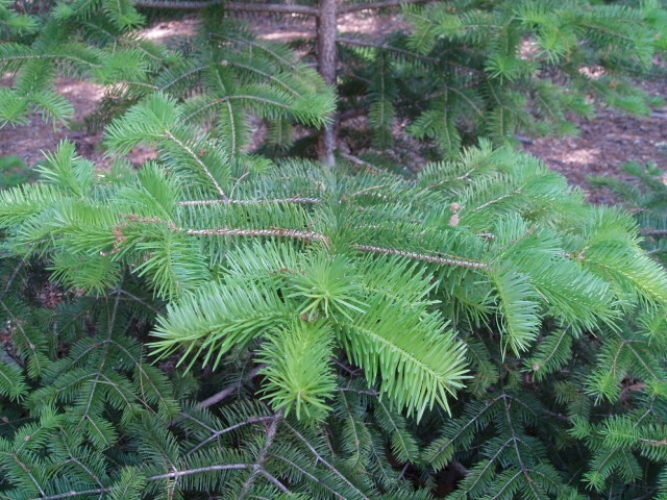 Abies nephrolepsis Photo taken in the Asian Collection of the US National Arboretum in Washington, D.C. during May 2006.